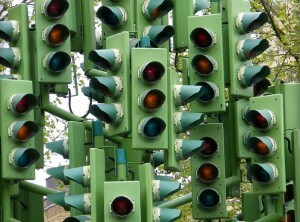 Can you imagine a city road network devoid of traffic lights? Carnegie Mellon University computer scientist Ozan Tonguz can. In fact, he’s creating one. How it would work: A car approaches an intersection and transmits data, such as location and speed, to other nearby cars. The Virtual Traffic Lights system would then process the information for all the cars in the area, with the help of a lead car that changes every cycle, and determines the individual traffic signal. So, instead of seeing a red or green light in the intersection, the lights would appear on the car’s windshield. The benefits of such a system would be twofold, explains the Atlantic Cities. First, every intersection with a car would automatically have a traffic light, increasing road safety. And two, the algorithm that controls the system would be designed to improve traffic flow, by being able to recognize which direction the heaviest line of cars is travelling and whether there are pedestrians or cyclists around. The Atlantic Cities notes that the basic technology to implement such a system already exists. “Car-to-car conversations can operate over Dedicated Short Range Communication at 5.9 Gigahertz — a radio system being tested and refined by the federal government. Tonguz expects D.S.R.C. to become mandatory for new cars soon, and he’s working on a prototype to retrofit older models,” the Atlantic Cities piece continues. The biggest hurdle, Tonguz says, is getting the US government to test the system in a real-world setting.